Take a moment to do a little inventory of your marketing strategies and the tracking you may or may not be using to measure their effectiveness. For instance, have you added tracking to all of the URL links inside your emails? If not, very often your analytics tool might incorrectly group visits from these links as direct or referral traffic. 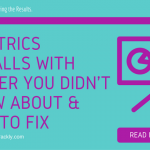 This creates discrepancies in the reporting between what your email marketing strategy has actually achieved, and what Google Analytics is telling you. If you can’t showcase convincing results, next time your product managers are running a campaign, they might decide to drop this invaluable channel and go for another that might end up being less effective or much more expensive for the company. 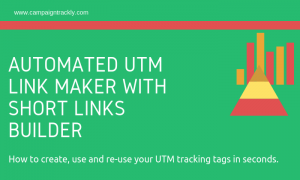 A very easy way to fix that is to introduce a simple email tracking process that uses UTM parameters – simple UTM codes added at the end of every link. Buffer and most other social media services will automatically add tracking links to your social posts. So when you look in Google Analytics you can see right away how many web visits were generated via your social tool. What you won’t know though is your social performance at the campaign level or how did a particular marketing campaign perform on Twitter. For example, did Twitter generate any traffic to your website for that campaign vs Likes, Retweets, and Clicks on your images. Feedback like that is essential, especially if you are looking to generate visits to a landing page – if a channel is not getting you enough visits, you need to know that sooner than later, so that you can adjust your strategy as you go to ensure you meet your goals. 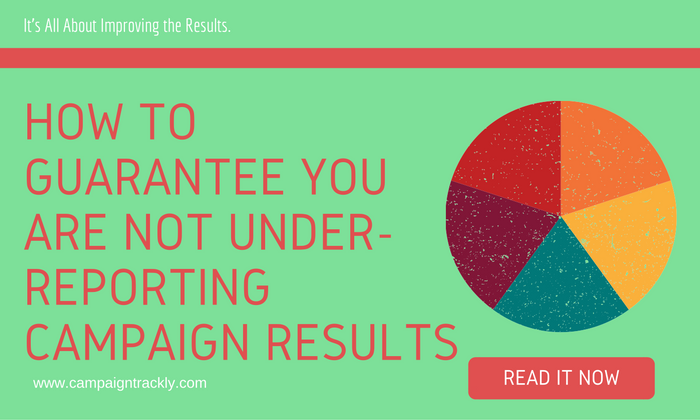 UTM parameters are a very cost-effective way to ensure you are measuring and recording your email successes. Free generation of UTMs – you can use quite a few free UTM tracking and campaign link building tools to set up your links. No added expense for reports – there is no extra cost to generating your reports, because Google will do that for free. Better insights – once you start applying tracking consistently, you might be surprised to see in more granular detail how effective your email channel is at engaging your existing and potential customers, for example. Get the bigger picture in A/B testing – when you A/B test email subject lines, landing page calls to action, or color variations UTM tracking helps you get more information about the overall success of the visits generated by the different element versions. You can get a lot more detail about paths, attribution, and more. Easier, faster reporting – Google Analytics has a nice out-of-the-box dashboard showing you how each channel contributed to the success of a campaign. You won’t need to spend hours building Excel reports. You can even set up automated periodic reports to go to your stakeholders – yes, your GA suite can do that for you. UTM codes or tags are not something that you add to your blog or copy-paste on your landing page. They have nothing to do with your website. If you have a page or blog post that you want to promote, you use a UTM code generator tool to handle the UTM work. This tool can be an excel spreadsheet, a Google sheet, or a website service. You will need to provide the web address of your page and specify the name of your campaign, and the channel you want to promote it on. The UTM generator, also known as URL builder will add special pieces of code to your link. Now that you have a long tracking link on your hands, you can use it to promote your page on Twitter, LinkedIn, Instagram, or in your emails. utm_source: Identifies the website or source from which the link will be clicked (Google.com, Facebook.com, Twitter.com, etc.). utm_medium: This element defines your channel (i.e. email, social media, ppc, etc.). utm_term: Term is optional. This applies in paid traffic instances where you would like to specify a strategic keyword. You can also use it to identify different positions for the same link in an email. utm_content: Content is used when you have more than one asset in your campaign – your link could be located inside an eBook, an event flyer, at the footer and header of an email, etc. Start by tracking the basics – source, medium, and campaign. Once you are fluent in the process, you can begin to delve into more granular ways of slicing and dicing your campaign data. Chances are, you might have a hard time creating proper UTM codes, or you might not be able to yield the best results out of your UTM parameters with all the manual work required to set them up. 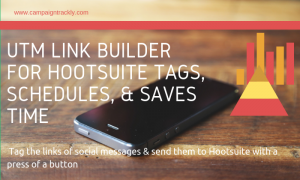 Creating UTM tags and adding them to your links takes a lot of time, and if you’ve never done it before, there is a learning curve. You don’t have the time to experiment, and people are depending on you to deliver results. 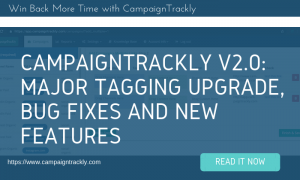 This is where a UTM parameter management tool like CampaignTrackly can benefit you greatly. 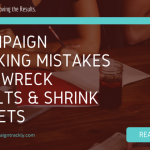 It is designed to simplify and automate the process of creating, adding, and shortening campaign UTM parameters for marketers, so they can save time and ensure their tracking code will be technically correct, and return all the data they need. It helps marketers follow a step-by-step wizard that enables them to accomplish their tracking set up tasks in seconds, even if they need to promote a campaign on 20, 30, or more channels. When used consistently, UTM parameters can be a marketer’s best friend – they can make sure that we never under-report our efforts and can provide us with really useful granular-level information about our audiences and their behavior. Best of all, they can enable us to simplify and speed up reporting tasks and showcase the real value we are creating for our organization. Are You Looking to Automate Link Tagging & Improve the Quality of Your Marketing Insights? Give CampaignTrackly a go. It can speed up tracking by up to 500% and significatnly reduces reporting errors.